It crosses the River Severn and River Wye, sort of between Newport and Bristol. Can you show me it on a map? What's this doing here then? Well, it's because I kind of feel a bit sorry for the M48. How the heck can you feel sorry for a road??? Once it was the main road across from southern England to South Wales. It was a great engineering achievement and yet today, only 40 or so years later, it's a quiet backwater - almost forgotten about somehow. Once upon a time, this was all part of the M4, full of traffic. Then came 1996. 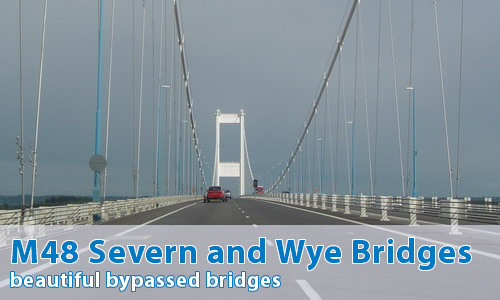 The Second Severn Crossing opened, and the M4 was diverted onto the new bridge. This was left as a kind of ox-bow road - too useful to close, but bypassed all the same. It's almost sad, really - everyone just trundles straight past on the M4, with only those who prefer the quiet of the old route turning off. Just think what they're missing - the new bridge is impressive, sure, but I don't think that it has the grace of the old bridges. Let's put it this way - I always choose M48 for my lower Severn crossing needs! Besides, I can't be doing with the Second Severn Crossing - well, it's just an utterly daft name. Because it's not Second at all. It's the most southerly road crossing, so it can't be Second there. It's not even the second motorway bridge across the Severn - there's one on the M50 as well. Or the Second crossing in the area - there's a railway tunnel here as well, and that came before the Second Severn Crossing. This road brings back many memories of childhood trips along the M4. The queues to get through the tolls. Stopping at Aust services and walking up to the viewpoint. Watching for the Welcome to Wales sign, though we all knew that the border was actually half way across the Wye Bridge. Talking of which, I reckon the Wye Bridge is the most overlooked major bridge in Britain. If it was anywhere else other than joined at the hip to the Severn Bridge, it would be a well-known landmark. As it is, people cross it with eyes only for the majestic Severn Bridge, missing its slender lines. Like you, the M48 is my bridge of choice across the Severn. Since 1996 I have been able to enjoy the crossing without having to deal with legions of traffic which now uses the new bridge. If you ever decide to run a subsidiary site called Pathetic Service Areas, the Severn View services ought to be the first on there. It's small, pokey, and there's no view of the Severn. A long way from the bustle of Aust with its panoramic views of the river and bridge. Probably my favourite motorway drive in the UK! Quiet as a doormouse now, ram packed pre 1996. Imagine all of the traffic the M4 carries squeezed into 2 lanes. In the late 80s there were some terrible, almost permenant roadworks on here, and at times the bridge closed completely for roadworks, which lead to a 50 mile diversion, possibly the largest ever to have existed in the UK. The 2nd bridge was needed, but as you say, the old one is almost forgotten about. There is NEVER traffic on this route. The service area was fantastic too. Covered walkways from the car park through a tunnel right into the heart of the service area, and a large restaurant area with a conveyer belt to put your trays on. If you ever drive to Wales this way, I urge you to take a detour, the drive itself is only around 15 mins, but worth it for odd signage, exciting side winds and clear roads. You almost sense you are driving on a motorway from 30 years ago. Its also one of the few motorways where you can legally walk on. All in all, a fascinating trip! The "old" Severn Bridge may be beautiful, and may be graceful, but sadly can only carry two lanes of traffic and high-sided vehicles suffer in bad weather. So in that respect, the M48 is in many ways pathetic. However whereas the post-1996 M4 just cuts a JCB-inspired swath through the flat lower marshlands near Rogiet, Caldicot and Magor, the M48 negotiates its way through culvets and nooks and crannies. One of my favourite bits of journeys to London was trying to out-wit my brother in being the first to spot the Severn Bridge towers. The game is somewhat lost on the new generation as you can see the SSC for miles. Coming westbound is also breathtaking. As you turn a corner you're suddenly upon the toll plaza. As you or your driver queues, stretching out in front of you is two miles of 1960s suspension bridge. It is awe inspiring. PS.. Welsh for London is Llundain (pronounced Thlin-dine). I have subsequently found out that in Welsh, there are in fact TWO words for London - Llundain as given, but also Caerludd is also used. I think the patheticosity of the M48 - its emptiness - is down to the signs at the start (or end). "Services, Chepstow", both within 1 mile of the motorway, makes it look useless. Destinations further up should be added: Monmouth, Ross, Hereford even (on the English side at least), all of which are easiest to get to from M48 J2. Alternatively we could take a leaf out of the US Interstates' book and designate it M4-ALT - then people would at least know there is a choice of crossings. Michael Clarkson mentions Caerludd as a translation of London. As far as I can tell, the origin of that one is an early mediaeval attempt at etymology in a strange story called "Cyfranc Lludd a Llefelys" (or, in mediaeval orthography, "Kyfranc Llud a Lleuelys") that got collected into the Mabinogion. Although I can see the romantic appeal, it almost certainly falls into the "nice story" category. For what it's worth, that passage also offers "Lwndrys", blatantly calqueing the Norman French. But it's clear that the usual name for London was Llundain even in the Mabinogion (e.g. when Bendigeidfran orders his head to be buried there -- if Caerludd had been a genuine name used within mythical history, he'd have used it). Returning to the pictures, I suppose the argument for the sign for Severn View services being monolingual is that the services are in England.